Born in Detroit, Michigan, Fred began playing in third grade, moving to Arizona in 1973 earning a BM in Music Education from the University of Arizona and MM in Trumpet Performance from Arizona State University. He has become one of the most in demand freelance trumpeters in the Phoenix Metropolitan area and first call lead trumpet player for Star Acts like Johnny Mathis, David Foster, Tony Bennett, Diana Ross, Al Jarreau and many others. 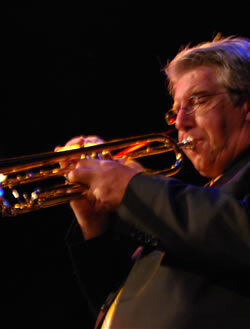 Fred also plays lead trumpet for touring Broadway Shows from New York, such as 42nd Street, Wicked, The Producers, All Shook Up, and virtually every tour that comes into Phoenix. Fred has also been a salaried musician with the Tucson Symphony and Phoenix Symphony Orchestras. Fred has held faculty positions at Tempe High School, Arizona State University and is currently the Director of Jazz Studies at Mesa Community College. He has been a clinician, adjudicator, or guest performer at high schools and universities in Arizona, Iowa, Oklahoma, and Kansas. His former students are teaching or performing in New York, LA, Nashville, Chicago and Phoenix. In recognition of excellence in teaching, Fred was awarded the Mesa Community College Outstanding Teacher Award for the academic year 2005 – 2006. Fred has played with internationally known jazz artists Bob Mintzer, Don Menza, Roger Kellaway, Pete Magadini, Bill Watrous, Judy Roberts, Ernie Watts, David Friesen, John Stowall, Dan Haerle, Pat LaBarbera, Bob Sheppard, Jim Snidero, Bobby Shew, Carl Saunders, Lewis Nash and others. He has performed at the Telluride Jazz Festival and toured the U.S. and Japan with the Bobby Caldwell Big Band playing the world famous Blue Note jazz clubs in Tokyo and Osaka. Current projects include The Armand Boatman Be Bop Revolution and The Arizona Jazz Masterworks Orchestra. In the recording studio, Fred has performed on countless jingles, C.D.s, nationally syndicated T.V. and Movie dates recorded in Phoenix. He has produced the jazz CDs "Into The Mist" (Summit Records), "Playground", "MCC Jazz Faculty", "Then and Now", "MCC Jazz Ensembles" and "Faculty Nonet" (Sea Breeze Records), "Justice for the Earth" with Chuck Marohnic and Seeds (Ravenswave Records), "The Armand Boatman Be Bop Revolution" (Tempest Records) and "Chasing Horizons" (OA2 Records).